On the daily, i try to wear as little makeup as possible. i work 5-6 days a week as a server, which anyone in the food industry can tell you, can be quite intense and physically taxing on your body. On top of that, the particular restaurant i work at is a hot pot style restaurant, where servers teach customers how to cook their food over burners that are steaming hot broth. The oils from the soup, mixed with the natural sweat i produce from running around the restaurant during peak hours, tends to take its toll on my complexion. I used to be a firm believer in not leaving the house without eyeliner, brows, and mascara, but I have found that i prefer a natural look while serving, so that when i do want to dress up for date night or other things, the impact of my efforts is greater. Besides, i’d like to think customers at this job appreciate me for how friendly the service is, & not how well i apply my makeup. The 1-2 shifts i work at my other job, a small local boutique, affords me the chance to “look pretty” without worrying about sweat/steam running my mascara. – after gently curling my lashes with my electroplated eyelash curler — just a few squeezes & im good; i apply 2-3 coats of either the falsies or the colossal mascara (they both work wonderfully for me so i interchange them without any bias or favoritism). waterproof is a must for my job or else halfway through the night i have racoon eyes. even on a normal night out, just the sheer humidity of hawaii’s weather usually causes me to grab for my waterproof mascaras over any other. 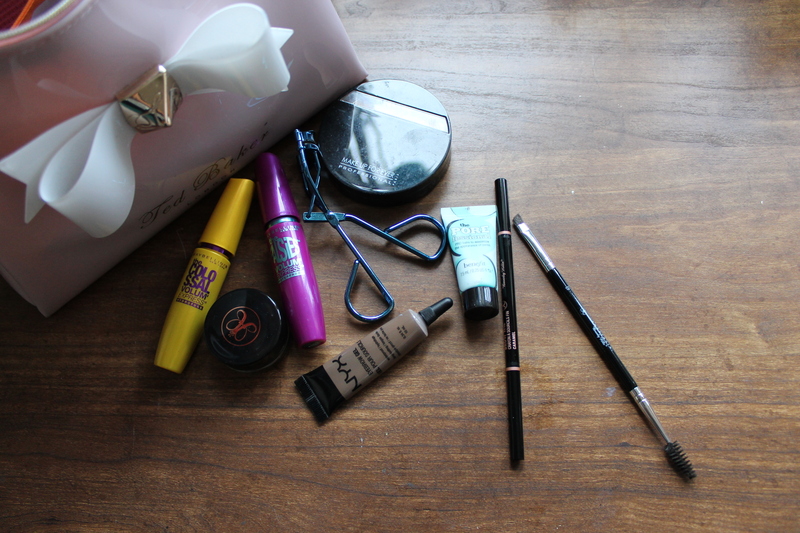 **side note: i am a maybelline convert after using Urban Decay’s cannonball mascara. This raved about cult favorite just doesn’t seem to give my lashes the volume and lasting curl that my drugstore maybelline contenders do. i hope this lengthy post proves to be beneficial in some way, if only to learn of the amazing staying power of some drugstore brands! let’s be honest, since graduation there’s been nothing to compel me to break out my galkyd, brushes, primed canvases, and sit down to paint. there’s no pressing deadlines, the fear of harsh critiques, or anyone to demand something “less stylistic” this time, or “less melodramatic”. i need to be my own motivation. thus, trusty blog, you shall be my critic, mentor, & competition. be patient, for i am ever so rusty.. This was the warning to heed, when i broke up with the first boyfriend my family deeply approved of.. and it was repeated again when i left the second. & backtracking into well-worn spaces. which is ironic because of how many times i hit dead end answers. Where do the good boys go? & careers, that are just missing that one piece — there. a good boy. now it all fits. is that to say i’ll be left with slim-pickings, or none at all? & i wrinkle, & age, & trade in my youth..
be more apt to deal with me? & the body of a girl not ready to settle? but will be replaced by something even better. oh, steer clear of that one. oh, we’re clear in that one! and save it to be savored at a later date. “Maturing with age,” you said. “Better with time,” you said. reassuring me this process ensured a culmination of all our best flavors. kept safe within those thick tinted walls. Author earthtomarsPosted on February 21, 2014 October 7, 2014 Categories wordsLeave a comment on Vintage.